Lilly and I stole this idea from Grace Helbig. So fun! I love Lilly! If you ship up, TWEET THIS VIDEO! YOUTUBE SUPERLATIVES! W/ iiSuperwomanii - YouTube Lilly and I stole this idea from Grace Helbig. So fun! I love Lilly! If you ship up, TWEET THIS VIDEO! YOUTUBE SUPERLATIVES! W/ iiSuperwomanii Lilly and I stole this idea from Grace Helbig. So fun! I love Lilly! If you... 00:04:41. Morning Routine Guys Vs. Girls! ACCENT CHALLENGE! 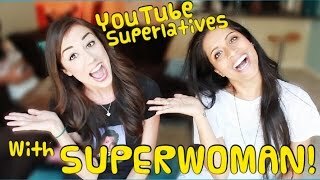 w/ IISUPERWOMANII ... YOUTUBE SUPERLATIVES! W/ iiSuperwomanii Lilly and I stole this idea from Grace Helbig. So fun! I love Lilly!